In this pioneering book, Christopher Whitehead provides an overview and critique of art interpretation practices in museums and galleries. Covering the philosophy and sociology of art, traditions in art history and art display, the psychology of the aesthetic experience and ideas about learning and communication, Whitehead advances major theoretical frameworks for understanding interpretation from curators’ and visitors’ perspectives. Although not a manual, the book is deeply practical. It presents extensively researched European and North American case studies involving interviews with professionals engaged in significant cutting-edge interpretation projects. Finally, it sets out the ethical and political responsibilities of institutions and professionals engaged in art interpretation. The role of exhibition texts, new interpretive technologies and live interpretation in art museum and gallery contexts. 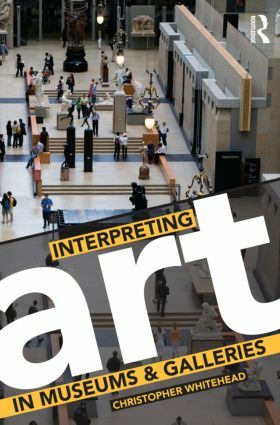 Thoroughly researched with immediately practical applications, Interpreting Art in Museums and Galleries will inform the practices of art curators and those studying the subject. Chris Whitehead teaches Museum, Gallery and Heritage Studies and runs the Art Museum and Gallery Studies postgraduate programme at the International Centre for Cultural and Heritage Studies, Newcastle University, UK. He has substantial experience of developing interpretive resources in museums and galleries and is the author of numerous books and articles in the field of museum studies.